Predatory behavior is that which results in the killing of another animal for food. Some predators, such as lions and tigers, are large and ferocious, while others can be small and benign in appearance, such as lady bugs. (Lady bugs, however, might seem ferocious to their prey, which are tiny insects called aphids.) Some predators, such as bears and crows, eat a mixed diet that includes a lot of plant material as well as other animals. Other animals, such as frogs, lizards, and most species of wild cats, are more strictly carnivorous, and their diet consists almost entirely of animals. Predators usually possess excellent senses to find their prey and special abilities to capture the prey. Predatory birds, for example, possess outstanding eyesight and often hearing, as in the case of owls. Other predators, such as many species of mammals, have a very keen sense of smell that helps them locate prey. Many predators are very fast, and use their speed to help capture their prey. Cheetahs, predators of the African savannas , are the world's fastest runners; falcons, predators of other bird species, are the world's fastest fliers; and dolphins and barracudas are very fast swimmers. Most species are potential prey for another animal at least sometime during their lives. Even lions and wolves can fall victim to other predators when they are very young. Most species possess several lines of defense against predators. Often the first line of defense is to avoid being detected by the predator. One way to do this is to minimize noise production and any visual cues that the predator might use to locate the prey. Frogs and crickets usually stop singing as another creature approaches. The resulting silence makes it more difficult for the predator to find them. Other prey have evolved camouflage coloration that blends into the background making it difficult for visual predators to find them. Many moths, common prey for birds, look like the bark of trees on which they rest during the day, and snowshoe hares, the primary prey for lynx, have brown fur in the summer but white fur in the winter when their northern environment is covered with snow. Because predators often use prey movements to detect them, many prey remain as still as possible when a predator approaches. 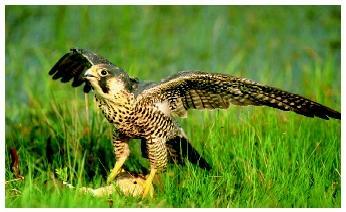 Predatory birds, such as this peregrine falcon ( Falco peregrinus anatum ), possess outstanding eyesight. The prey usually has other lines of defense it can utilize if spotted. Many prey species are very fast runners, swimmers, or fliers, and they often can use their speed to escape. Even if a prey is spotted and caught, or cornered, the result is often not a foregone conclusion. Many prey successfully deter a predatory attempt by fighting back. An adult moose is usually successful at warding off an attack by a pack of wolves, even if the moose has been surrounded by the wolves. The moose is able to use its hooves as lethal weapons against the much smaller wolves, and the wolves generally give up once they realize the moose is healthy and a formidable adversary. Some animals have morphological and behavioral adaptations that make it difficult for the predator to get the prey into their mouth. Many fish and insects have spines that prevent a predatory fish or bird from being able to eat them. Some prey, like the puffer fish, make themselves larger if threatened, again making it more difficult, often impossible, for the predator to ingest the prey. Many prey have evolved to use social behavior as a predatory defense. 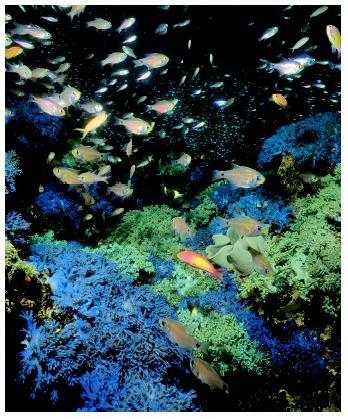 For example, many species of fish and birds travel in groups, such as schools of fish and flocks of birds. These schools and flocks often move very quickly in a highly synchronized fashion. Scientists believe that these groups provide protection for individuals in the group. Most predators have to single out and focus on a single individual in order to successfully capture a prey. However, the fast-moving and synchronized flocks and schools are believed to make it difficult for the predators to accomplish this. In some cases, a group of prey is able to successfully fight off a predatory attack, whereas an individual prey probably would not be able to do this. For example, although a baboon on its own would probably succumb to a predatory attack from a leopard, a group of males in a baboon troop can usually ward off such an attack. Some species of fish swim in a highly swim in a highly defend themselves against their predators. excellent example. These are small, brightly colored frogs that are easy to find, catch, and eat. However, they are very poisonous, and most birds quickly learn to avoid them. The indigenous people of these rainforests discovered that these frogs contain a potent toxin and learned to extract the toxin from the frogs. They then dipped the tips of their arrows in the toxin before going out on a hunting expedition. Ironically, by using the toxin that had evolved as an antipredatory defense, the people became more effective predators. Because the cost of being caught and eaten by a predator is so great, the intensity of natural selection on prey species has been very high throughout evolution. The selection pressure on the prey is probably higher than that on the predator. If a fox fails in its attempt to catch a rabbit, it just misses lunch. However, if a rabbit fails in its attempt to escape from a fox, it loses its life. Because of the intensity of selection on prey species, the variety and effectiveness of antipredatory defenses is especially impressive. It is believed that predators and their prey have coevolved. This means that as the predators developed adaptations that enabled them to capture the prey more successfully, the selection pressure on prey intensified, resulting in the selection of more effective antipredator adaptations. In turn, these more effective antipredator adaptations are believed to have promoted the selection of more effective predatory adaptations. This reciprocal ongoing evolutionary cycle among predators and prey is sometimes referred to as an evolutionary arms race. Fascinating, great for what I'm doing as researching animal coloration.